Find it First in LASN! There are 72 advertisements or product releases in this issue where the picture or ad has never before been published, what LASN calls "World Premieres." Look for the World Premiere icon in the Product Focus section (pages 28-33) and in red text the Ad Index (pages 137-138, 141-142). 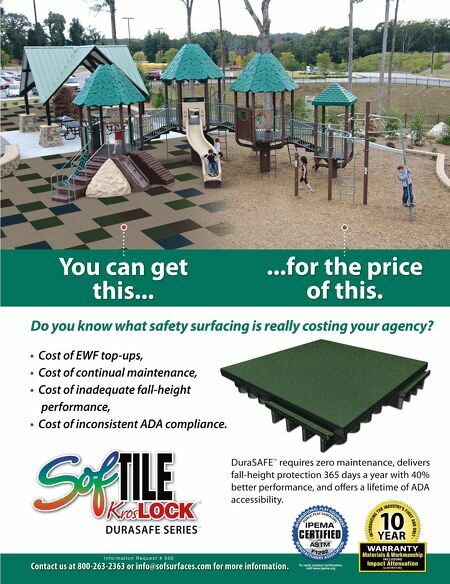 Contact LASN for more information on how your new product can be in the World Premiere spotlight! (714) 979-LASN (5276) www.landscapeonline.com World Premiere On the cover: Tom Sawyer Island at Amelia Earhart Park, North Hialeah, Fla. An Adventure in Nature: Creating a Play-in-the-Woods Experience. Landscape Architecture by Karen Cheney, RLA, LEED, Miami-Dade Parks, Recreation and Open Spaces, p. 70 Find 72 World Premieres in this Issue For Details See Page 8 World Premiere w w w . l a n d s c a p e o n l i n e . c o m THE INDUSTRY TRADE MAGAZINE FOR COMMERCIAL LANDSCAPE SPECIFIERS NA Volume 31 Number 09 September 2015 Volume 31 Number 09 8 Landscape Architect and Specifier News f e a t u re s 36 A Place for Inspiration, Reflection and Exploration: Israeli Discovery Playground at Tarbut V'Torah Community Day School, Irvine, Calif. The new K-5 Outdoor Classroom and playground features an exploratory learning garden, art studio, amphitheater and nature park, new playground equipment, a blacktop play area, a tricycle maze and a dry riverbed with a farm water pump. —by Kari Kikuta, ASLA, LPA, Inc. 44 Rotary Riverwalk Park, Des Moines Rotary Riverwalk Park, more colloquially known as "Bobber Park," features a 65-foot long steel fishing pole that cantilevers from the bank to form a most unusual swing set frame. The whimsical playground sculpture is a dramatic synthesis of art, architecture and engineering. —Landscape Architecture by RDG Planning & Design 48 Creative Playscape, City of Georgetown, Texas Creative Playscape is a playground homage to the history of Georgetown, Texas. The playground was renovated from its original wooden structures to an updated playscape, with GameTime play equipment. —Landscape Architecture by Halff Associates 56 Casey's Clubhouse—Playground with a Special Focus If baseball is America's favorite pastime, it reigns supreme in Upper St. Clair, Pa., a small township near Pittsburgh. Casey's Clubhouse and the Miracle League baseball field in western Pennsylvania are two of the reasons why. —Michael Miyamoto, LASN 62 Muckleshoot Child Development Center, Auburn, Washington The story of the new playground for Muckleshoot Child Development Center in Auburn, Washington maximizes the play value of the outdoor space for children, ages six weeks to 12 years old. —Project Manager: Hainline & Associates—Playground Design: Buell Recreation —Narrative: Katie Lousier, BCI Burke Premier Play Environments 70 Tom Sawyer Island at Amelia Earhart Park, North Hialeah, Fla. An Adventure in Nature: Creating a Play-in-the-Woods Experience During the 1970s the director for what was then the Metro-Dade Park and Recreation Department envisioned Amelia Earhart Park as an ideal location for a farm village where children could go to connect with nature and learn about animals. 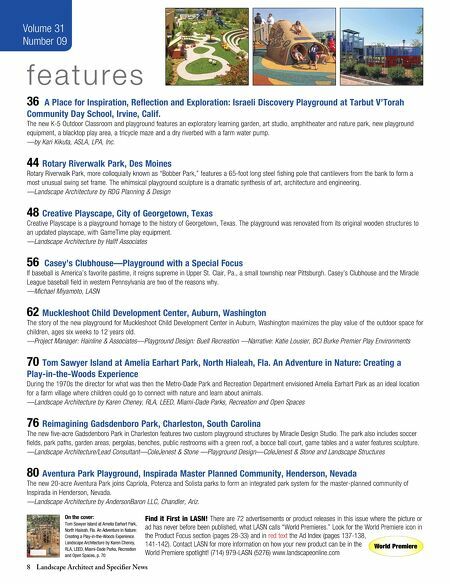 —Landscape Architecture by Karen Cheney, RLA, LEED, Miami-Dade Parks, Recreation and Open Spaces 76 Reimagining Gadsdenboro Park, Charleston, South Carolina The new five-acre Gadsdenboro Park in Charleston features two custom playground structures by Miracle Design Studio. The park also includes soccer fields, park paths, garden areas, pergolas, benches, public restrooms with a green roof, a bocce ball court, game tables and a water features sculpture. —Landscape Architecture/Lead Consultant—ColeJenest & Stone —Playground Design—ColeJenest & Stone and Landscape Structures 80 Aventura Park Playground, Inspirada Master Planned Community, Henderson, Nevada The new 20-acre Aventura Park joins Capriola, Potenza and Solista parks to form an integrated park system for the master-planned community of Inspirada in Henderson, Nevada. —Landscape Architecture by AndersonBaron LLC, Chandler, Ariz.